Two words can change the past, present and future of our great sport. Say them aloud and feel the rush of blood to your head, MMA trades. Hell, these two words could save the future of human cage fighting as we know it. The idea of MMA trades came unglued today (Oct. 24), from the far reaches of some abandoned UG forums to the biggest journalist in the game. MMA Trades are in and it may have just begun with the UFC shipping Mighty Mouse to ONE Championship for Ben Askren. On paper Mouse for Funky Ben is both a solid deal for all involved and the tip of the iceberg. Now that we have seen one hypothetical MMA deal we want them all and we want them right now. In all honesty, Johnson for Askren wouldn’t even make our top 50 possible OMFG trades between MMA promotions. We hooked up our minds to Professor X’s Cerebro device and came back with the top 10 best fantasy MMA trades that need to become a reality ASAP. Through this thought experiment we somehow came out the other side with Bellator President Scott Coker looking like Brad Pitt’s version of Billy Beane from Moneyball. Scotty is a wheeling, dealing, jet flying, son of gun in this top 10 and we don’t know why we did what we did. And yes, Sunday Morning Promoters we realize some of these hypothetical MMA trades would cancel out each other. We are not here to serve a single MMA promotion but the larger MMA Universe as a whole. Here are MiddleEasy.com’s top 10 fantasy MMA trades that make complete sense for the UFC, Bellator, ONE Championship, RIZIN and Invicta FC. Bellator has invested a ton in Ilima-Lei Macfarlane and the women’s flyweight division. But what if Shannon Knapp called up Coker and said you could start-up two divisions for the price of one champ? Que up that GIF of the lady from a black and white film yelling and clapping for violence. We need to see Rory MacDonald fight with soccer kicks in Japan and we need to see Coker make Gabi Garcia a star in Bellator like he did for Cris Cyborg back in Strikeforce. MVP gets to knockout cans for the remainder of his days in Rizin while Tenshin gets to carry the Bellator Kickboxing (and MMA) brands on his shoulders for the next decade. UFC gets a two weight class ONE champion in Aung La Nsang and the return of Kyoji Horiguchi in exchange for the current headache known as Khabib Nurmagomedov. Khabib gets to compete for both promotions and probably capture multiple titles as he expands his brand into Asia. Cris Cyborg is reunited with Scott Coker in Bellator while the ageless Cro Cop goes to the UFC to bolster their heavyweight roster and headline a couple Euro shows. As a sweetener King Mo gets to fight for his money-weight belt in all three promotions. A sign and trade deal! One Championships pays part of Eddie Alvarez’s salary in exchange for Gegard Mousasi and future American collegiate wrestler to be named later from Bellator. The UFC’s women’s featherweight division needs so much help. Bellator gives the UFC all 11 of their WMMA 145 pound fighters and gets back the entire UFC’s men’s flyweight division consisting of 34 fighters who need some Coker promoting magic. A four-way promotion deal is what it would take to wrestle away Conor McGregor from Dana White’s loving embrace. 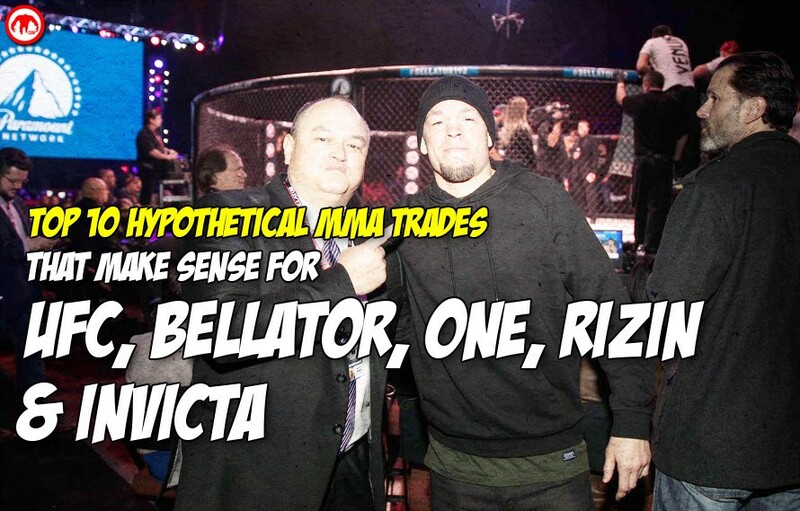 Mystic Mac asks for a trade and Bellator, One Championship and RIZIN come together to make the blockbuster deal. Bellator offers up all eight fighters from it’s heavyweight grand prix. One Championship sends over future crossover star Angela Lee. And Rizin helps out by sending female star (and future Zuffa boxing headliner) Rena Kubota to the UFC. Ten fighters is all it would take for the UFC to ship off McGregor. This just makes too much sense. Let’s says, fro example, Jon Jones gets busted by USADA/gets arrested for a DUI/knocks out an annoying MMA fan at a Buffalo Wild Wings and the UFC has just had enough. Bellator empties its prospect war-chest filled with future champions James Gallagher AJ McKee, Aaron Pico and Ed Ruth for the rights to revive Bones Jones’ career. The GOAT gets a fresh start and the UFC gets four high upside lottery tickets to cash-in. You know what? Out of all our MMA trades this one still makes the most sense. Free the Diaz brothers and let Michael Chandler test himself versus the UFC’s 155 pound shark tank. *extremely Bill Simmons voice* Who says no?!?! The Time Might Truly, Actually, Really Be Now.